Religion*: Angus "Ban" MacFarlane was Roman Catholic. Biography*: The 1881 Census lists Angus as a farmer. The 1891 Census lists Angus as a farmer and a wage earner who could both read and write. His home was a two story nine room wooden dwelling. The 1901 Census says that Angus could both read and write in English, but not French. [S328] April 11, 1881 Canada Federal Census, 101 Newbury Street, Boston, Suffolk, Massachusetts, USA. [S341] Registration form to Gathering 2001 Committee, August 3, 2001, sheets 49, 63. [S701] Certificate, see memo marriage of 1862-1908, McFarlane-Coady 1877. [S341] Registration form to Gathering 2001 Committee, August 3, 2001, sheets 49, 54. [S709] Diocese of Antigonish, Nova Scotia, Canada , Baptismal record of James Angus McFarlane, page 72. [S709] Diocese of Antigonish, Nova Scotia, Canada , Marriage record of Angus McFarlane and Margaret Coady, page 137. [S273] April 1901 Canada Federal Census, 101 Newbury Street, Boston, Suffolk, Massachusetts, USA. [S709] Diocese of Antigonish, Nova Scotia, Canada , Baptismal record of James Angus MacFarlane, page 21. Language*: Margaret Coady spoke English. Language*: Walter Scott MacFarlane spoke English. 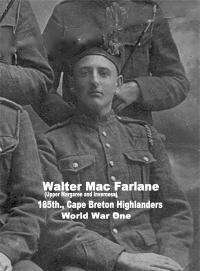 Walter Ban MacFarlane, 83, died in Inverness Consolidated Hospital on March 12, 1979. Born at Upper Margaree, a son of the late Angus "Ban" and Margaret (Coady) MacFarlane. Veteran of two World Wars. 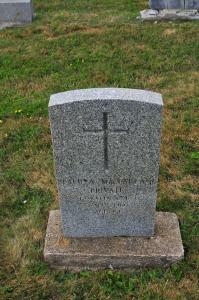 enlisted in WW I on September 12, 1914 - discharged on October 10, 1919 then returned to Margaree until WW II. Served over seas from 1942 - 1946, much of the time in charge of transportation of Prisoners of War. Survived by his wife the former Annie Jane LeBlanc; 2 sons - Peter & Pat; two daughters; Ethel and Lucille, three grandchildren and one sister Eliza Donnelly of Jasper Park, Alberta. Biography*: The 1901 Census says that Walter could speak English, but not French. Veteran of two World Wars, he enlisted in World War I on September 12, 1914 and was discharged on October 10, 1919. He then returned to Margaree until World War II. He served overseas from 1942 to 1946, much of the time in charge of transportation of Prisoners of War. [S9] Births, Church Record, June 1977 to September 1944 St. Joseph's Church, Margaree, Records, page 32, line 22. [S429] Obituaries from The Halifax Chronicle Herald Newspaper, Obituary of Peter Angus MacFarlane, August 23, 2007. Religion*: Margaret Elizabeth MacFarlane was Roman Catholic. Biography*: She went to Jasper, Alberta as a young teacher. [S341] Registration form to Gathering 2001 Committee, August 3, 2001, Sheet 54. [S9] Births, Church Record, June 1977 to September 1944 St. Joseph's Church, Margaree, Records, page 42, line 1. [S341] Registration form to Gathering 2001 Committee, August 3, 2001, Sheet 32, 36. [S280] Margaret, Obituary acFarlane, acFarlane, Margaret, Obituary. [S341] Registration form to Gathering 2001 Committee, August 3, 2001, Sheet 32. [S341] Registration form to Gathering 2001 Committee, August 3, 2001, Sheet 32, sheet 54. Language*: James Angus MacFarlane spoke English. Biography*: According to the 1891 Census James could both read and write. The 1901 Census says that James could both read and write in English, but not French. this census gives his month of birth as September, but contemporaneous Church records are accepted. [S9] Births, Church Record, June 1977 to September 1944 St. Joseph's Church, Margaree, Records, page 4, line 10. National Archives and Records Administration (NARA); Washington, D.C.; Indexes to Naturalization Records of the U.S. District Court for Western Washington, Northern Division (Seattle), 1890-1952 (M1232); Microfilm Serial: M1232; Microfilm Roll: 1. [S506] Robert Joseph Gillis, Two Gillis Families, page 92. Language*: John Hugh MacFarlane spoke English. Biography*: The 1901 Census says that John Hugh could both read and write in English, but not French. [S9] Births, Church Record, June 1977 to September 1944 St. Joseph's Church, Margaree, Records, page 14, line 10. [S341] Registration form to Gathering 2001 Committee, August 3, 2001, Sheets 63, 68. Language*: Hugh A. MacFarlane spoke English. Biography*: The 1901 Census says that Hugh could both read and write in English, but not French. Religion*: Archie Peter MacFarlane was Roman Catholic. Biography*: The 1901 Census says that could speak English, but not French. This census lists his date of birth as October 7, but contemporaneous Church records are accepted. [S341] Registration form to Gathering 2001 Committee, August 3, 2001, sheet 49. Language*: Annie MacFarlane spoke English. The recent passing of Mrs. Annie MacIsaac at Port Hood, after an illness of more than three months, caused wide-spread grief to her family, her acquaintances, and a large circle of relatives and friends. 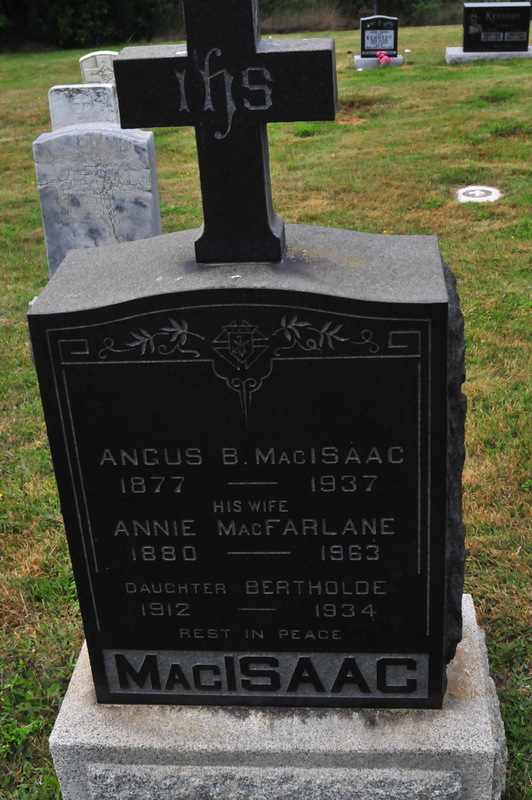 Relict of Angus B. MacIsaac (Stellarton Angus), who was Custom Officer for many years and who died in 1937, she was born at Upper Margaree, in September, 1880, the daughter of Mr. and Mrs. Angus B. MacFarlane. (Aonghas Ban) formerly of that place. She married Mr. MacIsaac in the early nineteen hundreds, and lived in Inverness a number of years before going to reside in Port Hood, about 45 years ago. Throughout her illness, which she bore with true Christian fortitude, she was lovingly and tenderly cared for by her daughter, Peggy, (Mrs. Lanford, R. N.), who resided with her mother, and during the latter weeks of her illness by her daughters, (Mrs. Carter, R. N.), Lillian, (Mrs. MacLellan) and Kaye, (Mrs. MacDonald), who came home to help. The deceased was a devout member of St. Peter’s Church, Port Hood. Mrs. MacIsaac was a woman who possessed many excellent qualities. Charity, the greatest of all virtues, was deeply ingrained in her gentle soul. Her kind, cheerful disposition made her a favourite in her home and community, and she was always willing to help in time of sickness or trouble. Her ready wit, friendly words of welcome and sweet smile will long be remembered and sadly missed by the many who loved to visit in her home. 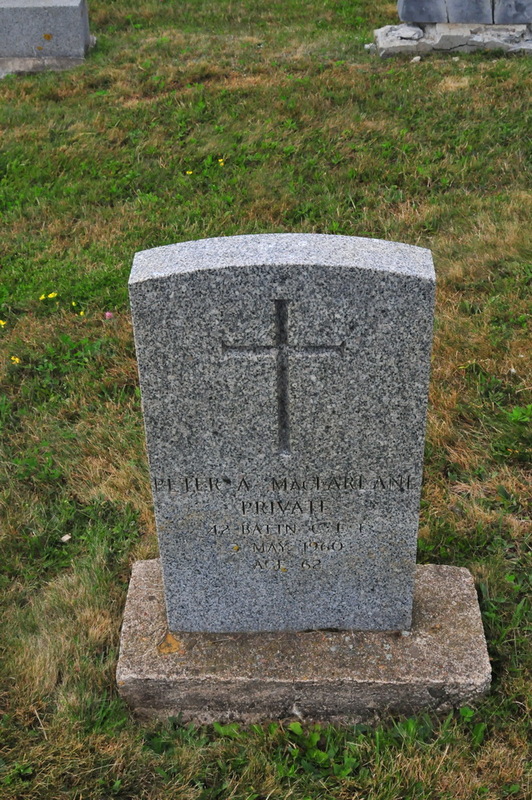 She is survived by four sons and four daughters: Hugh and Angus J., Niagara Falls; Stellie, Creighton Mine, Ont; Staff Sergeant Alex MacIsaac of Cornwallis, N. S; Lillian (Mrs. James R. MacLellan), Halifax; Hughena (Mrs. Tom Carter) and Catherine (Mrs. Alex MacDonald), of Sudbury; and Margaret (Mrs. Lafford), of Port Hood. 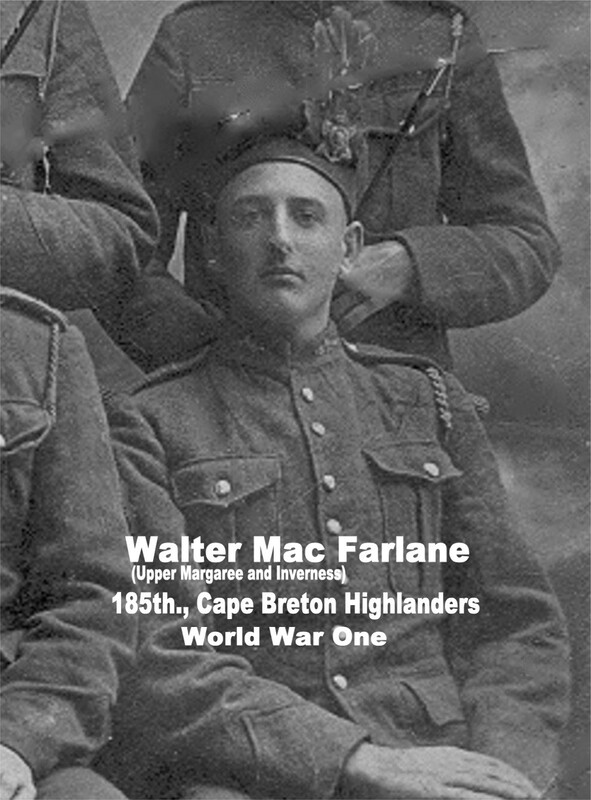 Also surviving are one brother, Walter S. MacFarlane, of Inverness and two sisters, Mrs. James Moran of Fordview, Margaree and Mrs. Patrick Donnelly, of Jasper, Alberta; 41 grandchildren and eight great-grandchildren. One daughter and two infant sons predeceased her. The funeral, which was largely attended, was held from her residence in Port Hood to St. Peter’s Church, where Requiem High Mass was celebrated. From Port Hood the funeral proceeded to Inverness where the mortal remains of beloved Annie (Angus Ban) was interred in the family plot in Stella Maris cemetery. Biography*: According to the 1891 Census Anne could both read and write. The 1901 Census says that Annie could both read and write in English, but not French. Religion*: Mary Catherine MacFarlane was Roman Catholic. Name-Comm: Her common name was Mary Kate. Biography*: The 1901 Census says that Mary Kate could both read and write in English, but not French. [S9] Births, Church Record, June 1977 to September 1944 St. Joseph's Church, Margaree, Records, page 22, line 20. [S5] Marriage, Church Record, November 1884 to September 1935 St. Joseph's Church, Margaree, Records, page 94, line 4.